Pam’s Pictorama Photo Post: This great card is one that almost got away – not just at auction, but due to a prolonged detour through the mysteries of the US Post Office. I was greatly relieved when it arrived safely on my doorsteps after a nail biter of a week or so. (The eBay seller, lovesoldthingstoo, was wonderful and was ready to refund me when it showed up about ten days late and we both cheered!) Anyway, it landed safely in my hands and I must say I don’t have anything else remotely like it. This card was sent to Miss Anna Kuhn (a relative we will assume) in Woodstown, NJ on September 2, 1907. Brooklyn, NY is printed in pencil at the bottom and T.H. Tuohy in script, the same hand as addressed the back, at the bottom. I was very entertained to learn that the Chas. Kuhn Company of Brooklyn had an exhibition space on the second floor. It can be found under listings of artist exhibition bios of the day. It is also mentioned in the context of photo suppliers of the day. One of the places to see and be seen in the Brooklyn of the teens. 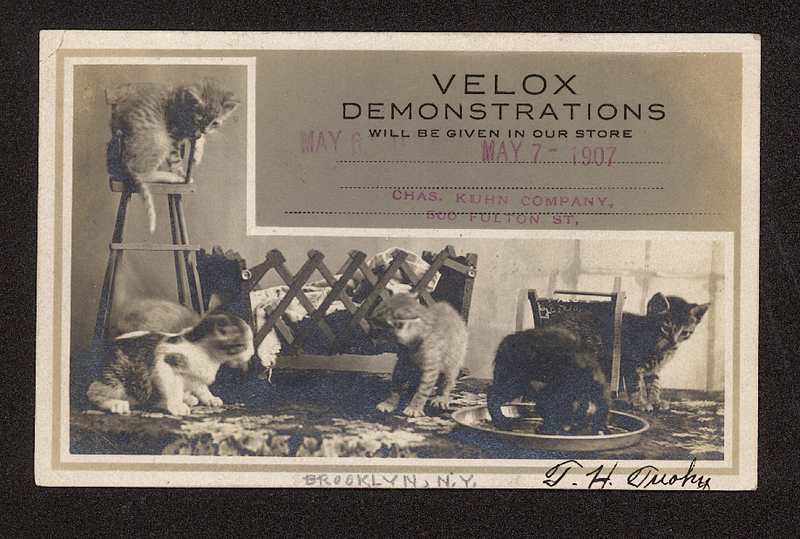 Although photo postcards date back further, Kodak’s introduction of Velox paper in 1902 – the ability to print an negative right onto a ready postcard – is the beginning of the form’s real popularity. Collector’s Weekly has a handy history of real photo postcards, found at Real Photo Postcards, and they mention the Kodak 3A folding camera that was made for use with this film. Priced at $20 it was a princely sum – but very appealing either to wealthy amateurs or, more likely, those setting up shop as itinerant photographers. Suddenly everyone was a photographer and your blogger’s future as a collector crystalized decades before her birth. The format was available at least into the 1970’s, but I could not find a definitive end date for production. The postcards will bring endless pleasure.